There are strong environmental and economic arguments for and against the introduction of a carrier bag levy in Northern Ireland. Today Environment Minister Alex Attwood has launched this new initiative at Primark’s Bank Buildings Store in Castle Street in Belfast and the debate about the levy will rumble on. You will now be charged at least 5p for new single use carrier bags whenever you shop. 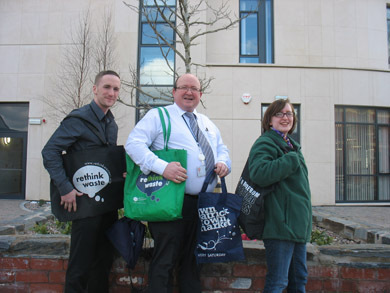 Barry Treacy, Joe Parkes and Lucinda White show off the reusable bags that Down District Council are giving away to shoppers. “Monday 15 April at Tescos, Newcastle from 10am – 4pm; Tuesday 16 April at Supervalu, Ballynahinch from 10am – 4pm; and Friday 19 April at ASDA, Downpatrick from 10am – 4pm. The introduction of the carrier bag levy has caused concern among in the retail sector. With today (Monday 8th April) seeing the introduction of the Carrier Bag Levy, the Northern Ireland Independent Retail Trade Association (NIIRTA) has expressed major concerns over the scheme but has pledged to work with the DOE on its implementation. NIIRTA Chief Executive Glyn Roberts said: “While we have major concerns with the Carrier Bag Levy we will work with the DOE to ensure that its implementation causes minimum disruption to our members. “We believe that sensible changes to the scheme, such as capping it at 5p, letting retailers distribute the levy proceeds to local charities as is the case in Wales and dropping some of the ridiculously high fines should be made. “We are concerned that the collecting and administration of the levy may pose a real burden on our members and we will be closely monitoring this over the next few months. “This is the wrong stealth tax at the wrong time. During this recession small retailers should be focused on running their shops rather than tax collecting for the DOE. This will also add to the burden of hard working families who will have to pay for this. Environment Minister Alex Attwood today launched Northern Ireland’s new 5p Single Use Carrier Bag Levy. Retailers in Northern Ireland must now charge shoppers at least 5 pence for each new single use carrier bag. The levy applies to each bag rather than each visit to a shop and is intended to slash the estimated 250 million single use bags used here every year. The levy is not restricted to plastic bags. It also includes paper, starch and other natural materials. Launching the new levy in Primark’s Belfast Bank Buildings store, Minister Attwood said: “In Northern Ireland we are using 30,000 carrier bags each and every hour. This levy is intended to help protect the environment by dramatically cutting the number of bags used. Working with the retail sector we are aiming for a reduction of at least 80%. Some retailers have already indicated that they will be eliminating single use bags altogether. “There is already a high awareness among people here of charging for bags, not least because that is our experience travelling to the republic. I believe we can quickly adjust to the levy. People tell me they are concerned about climate change and want to find ways to make personal, family and local contributions to addressing the threat. The levy is precisely this. There are practical exemptions – on the grounds of hygiene and food safety, when a bag is essential to protect goods or consumers and for prescription items. The levy doesn’t apply to bags manufactured for reuse (plastic reusable bags must conform to requirements in the legislation), some small bags, bags to carry hot food/drinks to be consumed away from a retail outlet, bags for items on prescription and bags solely containing packaged uncooked meat, poultry or fish (subject to the dimensions in the legislation). Retailers are required to pass the proceeds of the levy to the Department of the Environment each quarter. The levy is expected to generate a significant amount of money to help community and voluntary organisations, businesses, schools and charities improve the environment. Minister Attwood added: “My Department has been working with retailers to keep administration of the levy as straightforward as possible. Well over one thousand businesses have already completed their online registration. I’m urging any business dispensing new single use bags, that hasn’t already done so, to register now at http://www.nidirect.gov.uk/baglevy or call 0300 200 7879. The process only takes a few minutes and will make it simple for retailers to make returns to the Department from this July. * If shoppers always bring their own bags they never have to pay the levy. * Retailers should have received a registration letter containing their unique User ID and password in March 2013. 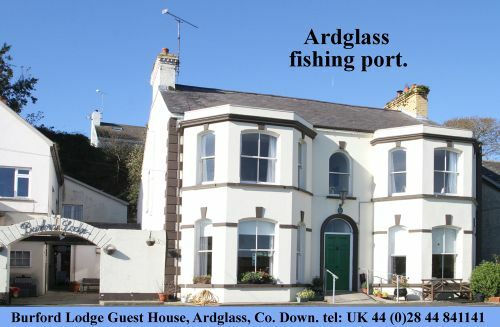 They can use these details to complete their registration online at http://www.nidirect.gov.uk/baglevy. Once registered retailers can make online returns from 1 July 2013, when the first quarterly return is due.